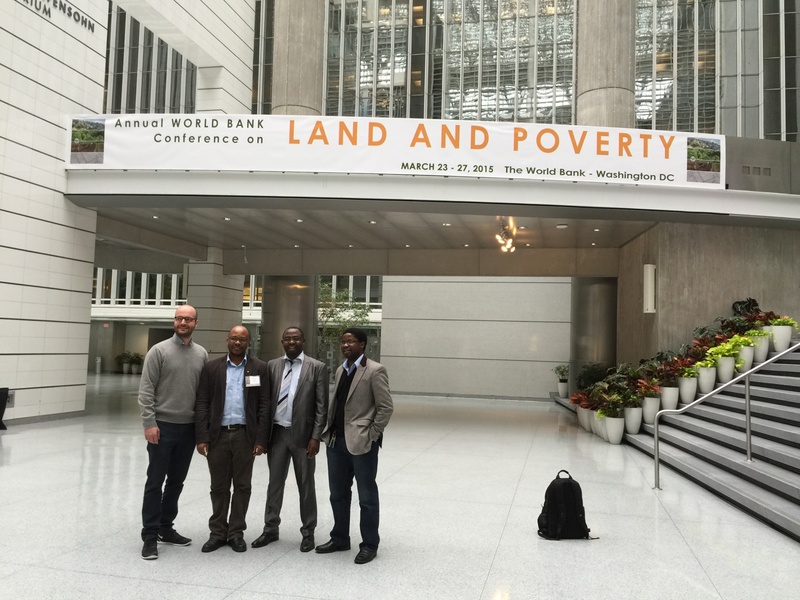 Three AGGN fellows, namely Dr. Uchendu Eugene Chigbu (Technical University of Munich), Dr. Samuel Mabikke (UN-Habitat, Nairobi) and Mr. Andrew Chilombo (Global Environment Facility (GEF) at the World Bank Group, Washington DC) met at the Annual World Bank Conference on Land and Poverty. The fellows presented scientific papers, chaired major sessions and conducted several master classes during the conference. They as well met Mr. Benedikt Kamski, a Research Associate from The Arnold-Bergstraesser-Institute (ABI) who had co-organized the AGGN Summit in Nigeria in 2013. True to the convening power of the network, this conference served as an example of how AGGN fellows in their different capacities and professional careers come together to contribute to important global and international governance discussions that shape the socio-economic and political landscape of resource governance in Africa. The conference is organized by the World Bank Development Economic Research Group (DECRG) in collaboration with partners like the United Nations Human Settlement Programme (UN Habitat) and the United States Agency for International Development (USAID). It is a key global event where representatives from governments, bilateral and multilateral organizations, civil society, academia, policy makers, the development community and the private sector come together to discuss new developments and progress on land policy and implementation at the World Bank Group Headquarters in Washington DC, USA. The conference aims to foster dialogue and sharing of best practices on the diversity of reforms, approaches and experiences that are being implemented in land sectors around the world. It is a platform for a wide array of practioners in land related issues where they share experiences at the level of research, projects, land governance in the developing world and good practices and how these are linked to poverty reduction in affected countries. Under the theme ‘Linking land tenure to land use’ the conference brought together over 1200 participants from 123 countries.